urchin softlight has an animate design and tactile character that invites playful interaction. The elastic three-dimensional honeycomb geometry of urchin softlight will morph through a multitude of forms as you rotate it through and around its own centre with your hands. It can even be turned inside out to create straight walled cylinders and conical forms. Adjusting the form of urchin also adjusts the intensity, direction and quality of light - a beautiful, tactile way of shaping the light of an intimate space. 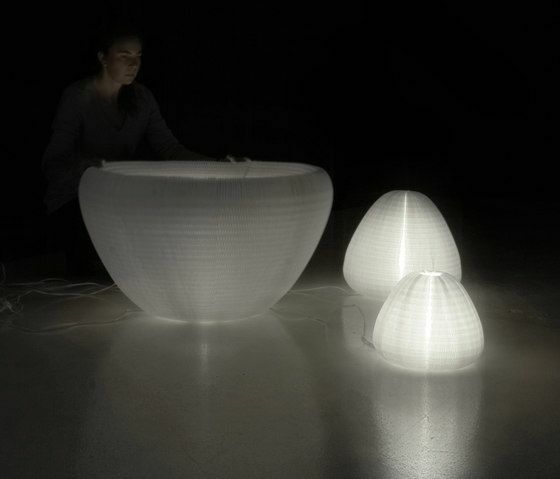 The flexible urchin softlight is made from a paper-like, non-woven polyethylene textile. The polyethylene textile is tear, UV, and water resistant; fire and acoustic rated; and 100% recyclable. Illuminated with a dimmable, energy efficient LED light source, urchin is available in 3 sizes and can be illuminated by either ‘daylight white’ (4800K) or ‘warm white’ (3300K) energy-efficient LED. urchin softlight is available in three sizes and belongs to molo’s innovative, award winning soft collection of expandable/compressible furniture, lighting, and space partitions created from flexible paper and textile honeycomb structures.